At our Orchard Spa we offer a number of exquisite spa treatments and packages. Choose from any combination of facials, massages, body treatments and waxing services. Our expert team of spa professionals includes world-class masseuses and aestheticians. You’ll be in capable, experienced hands when you trust our Livermore couples’ day spa with your relaxation and rejuvenation. At our luxurious spa oasis, you and your partner will enjoy plush robes, slippers and towels, as well as private lockers. Indulge in the relaxation lounge, nibble on a light snack, and unwind with a selection from the wine menu. If you book a stay at The Purple Orchid, you can experience the serenity and privacy of our accommodations. Take your Livermore couples’ spa experience to the next level by sharing it with someone special, whether it’s a parent, a partner, a spouse, or a friend. All our couples packages promote wellness and tranquility–the perfect combination for strengthening a relationship. Packages include California Grove for Two, Orchid Romance for Two, and Vineyard Romance for Two. Massages are enhanced by a calming ambiance. Deep relaxation is achieved with the ancient hot stone massage technique, in which warm, smooth stones are used as an extension to the therapist’s hands. You can bring this Livermore couples’ day spa experience home with you by booking our couples’ massage class. This option features 2 hours of hands-on instruction with a licensed massage professional. You and your partner will learn how to give each other a back, neck and shoulder massage. You’ll get to take come a couples massage book, massage tool, bottle of Hand Prints Massage Oil and chocolates. After experiencing the benefits of The Purple Orchid’s own Handprints Estate Extra Virgin Olive Oil, you can purchase some to take home with you. The olives are grown on-site and the oil is of the highest quality, 100% first-pressed, unfiltered, extra virgin olive oil. You can use this for at-home spa treatments or for cooking! 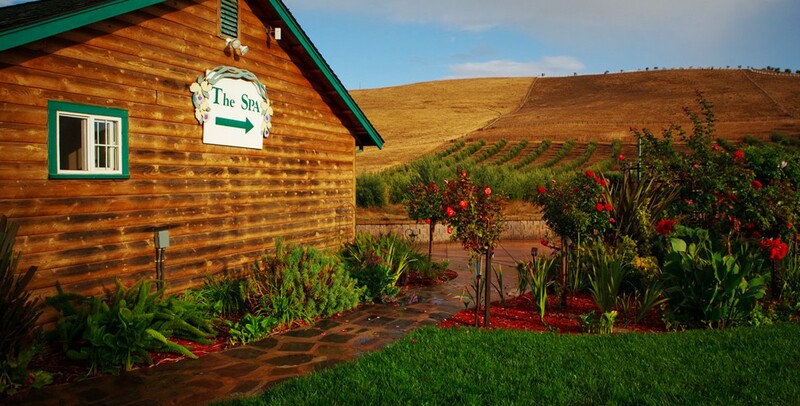 Book your Livermore Valley getaway and stay at The Purple Orchid, where you can enjoy top-notch accommodations and outstanding spa treatments. To make the most of your trip, download our free Livermore vacation guide. Check our blog regularly for ideas and deals. Check back at our website to book your stay and your spa treatments. With all the beauty of California wine country and our proximity to the Bay Area, selecting The Purple Orchid for your Livermore couples’ day spa experience will open up countless possibilities. Our Top 7 Reasons to Vacation in the Livermore Valley — Wondering Where to Stay for the Big Game?